Did you know that Brussels is one of the greenest cities in Europe? Green spaces make up half of the Brussels region - and if you're looking for a leafy suburb to call home, Auderghem's Val Duchesse neighbourhood is hard to beat. On the edge of the Sonian Forest, this sought-after residential district is home to the Val Duchesse domain and is minutes from the Parc de Woluwe and Rouge-Cloître abbey. It's no wonder several countries have established their embassies in the neighbourhood over the years. "We're in a very green environment," says Vincent Sneyers, director of Belfius Immo, which is busy building Résidence Delvaux, a stylish complex of 60 apartments on Rue Steeno. "We're a few hundred metres from a park, with views over greenery and almost all of the apartments have large sunny terraces." Two-thirds of the properties in this new development have already been sold - but there remains something for all needs and budgets. A one-bedroom apartment is for sale at just €217,000. Or there's a luxury 230m² four-bedroom penthouse on the fifth floor, complete with a 142m² terrace, for just over €1 million. "We always look at investment potential before we begin," says Sneyers. "Belfius Immo works first and foremost with investor clients, so we do a thorough market study beforehand to check there's an attractive return on investment. For renting and property management we always work with a local estate agent who knows the area and can provide a truly local service." Building a brand-new property means meeting Brussels' high standards in terms of energy efficiency and insulation. 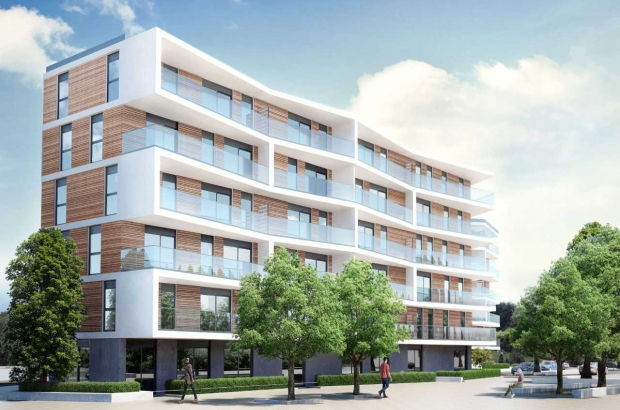 With its modern design combining wood and concrete, Résidence Delvaux will be a low-energy building. And if you're not familiar with the neighbourhood, all the facilities you need are within walking distance, including a creche, several schools, a large shopping centre and restaurants. Nearby Auderghem Cultural Centre has a rich programme of theatre and comedy - including several productions during the year by English-language expat groups. The area is well connected by public transport. Hop on tram 94 for some shopping on Avenue Louise, bus 34 for the European district or metro line 5 to be whisked into downtown Brussels. Car access is also straight-forward, with easy access to the E411 and the Brussels ring. Last but not least, as a subsidiary of Belfius bank, Belfius Immo can help put you in contact with the right people for arranging a mortgage or getting your new home insured - making buying a property in Brussels as smooth as possible. Résidence Delvaux is due to be completed in January 2019, ready for you to settle in your new home in the new year. "Just" €217,000 for a one bedroomed flat. Well that's incredibly affordable. I was afraid they'd be expensive yuppie pads.